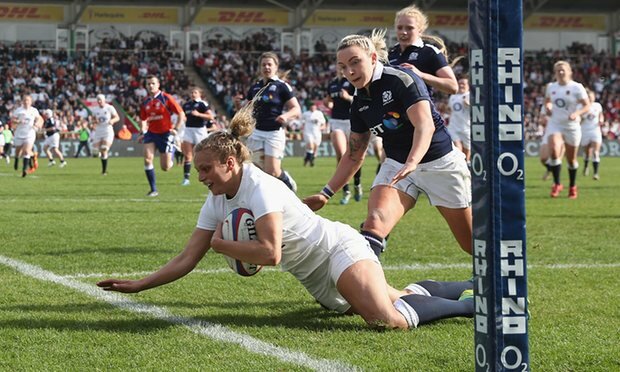 England ran in 12 tries in a 64-0 hammering od Scotland, with Kay Wilson scroring a record even tries and Amy Cokayne also scoring a hat-trick. The result means that England head to Dublin for a title decide on St Patrick's Day this Friday night, in what should be a memorable encounter at Donnybrook. The only blot on England's copybook were the 10 missed conversions from Emily Scarratt -who had a fine game otherwise - though most of the tries were scored out wide. England were relentless from the off, starting the scoring in the third minute when Kay Wilson took a pass from Scarratt and she had her second four minutes later when she was released by Harriet Millar-Mills. Scotland No.8 Gemma Forsyth was sent to the sin bin in the 11th minute and soon after Cokayne was on the back of a driving maul to score her first of the afternoon and she secured England's bonus point after 20 minutes when she bundled over. Waterman was then on the end of a flowing move three-minutes later to continue her fine record in the competition. Wilson sealed her hat-trick in the 26th minute after receiving a long pass from Amber Reed and she showed her finishing instincts seven-minutes later to become the first player to score four first-half tries in the Women's Six Nations. Cokayne scored her third try and her team's eighth on the stroke of half-time after collecting her own charge down. It was the first time since 2002 that a team had ran in eight tries in the first half of a Women's Six Nations match. Wilson started the second period in the same vein as she raced away to cross for her fifth try five minutes after the break. And on the hour mark the Richmond wing became the first player to score six tries in a Women's Six Nations match when she received another pass from Scarratt. Scarratt crossed five minutes from time following an Alex Matthews offload and Wilson darted over again soon after to complete the scoring. “We’re thrilled with that performance. We had a clear picture about what we wanted to do, to play with intensity and tempo, and we delivered that for the most part," Head Coach Simon Middleton said. Scotland Head Coach Shade Munro said: “England are an excellent team. Their speed of ball, speed of realignment of speed of pass was better. “We took it to them in the second half and tried to implement what we were planning on doing and some of it came off. England: Danielle Waterman (Bristol), Lydia Thompson (Worcester Valkyries), Emily Scarratt (Lichfield), Amber Reed (Bristol), Kay Wilson (Richmond), Emily Scott (Saracens) , La Toya Mason (Darlington Mowden Park Sharks); Rochelle Clark (Worcester Valkyries), Amy Cokayne (Lichfield), Justine Lucas (Lichfield) , Harriet Millar-Mills (Lichfield), Tamara Taylor (Darlington Mowden Park Sharks), Alex Matthews (Richmond), Marlie Packer (Bristol), Sarah Hunter (Bristol). Replacements: Vicky Fleetwood (Saracens), Vickii Cornborough (Aylesford Bulls), Sarah Bern (Bristol), Poppy Cleall (Bristol), Izzy Noel-Smith (Bristol), Bianca Blackburn (Worcester Valkyries), Rachael Burford (Aylesford Bulls), Sarah McKenna (Saracens). Scotland: Chloe Rollie, Megan Gaffney, Lisa Thomson, Lisa Martin (capt), Rhona Lloyd, Helen Nelson, Sarah Law; Tracy Balmer, Lana Skeldon, Lindsey Smith, Emma Wassell, Deborah McCormack, Sarah Bonar, Louise McMillan, Jemma Forsyth.